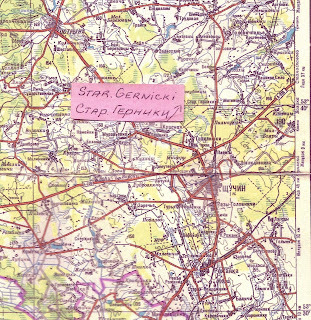 Serendipity brought me the pink Post-it affixed to the Scucin/Szczuczyn area of the Belarusian “Grodno and Environs” map shown here. About 12 years ago, when I was looking for contemporary maps of Belarus, I found this one (along with the Welcome to Belarus map detailed on October 21) online at a now-defunct Canadian Web site that I think was called 411maps.com. I wanted to make a credit card purchase, and since there was no way to do a secure transaction online back then, I had to phone Ontario to provide my card number. The young woman who answered the phone was quite personable, and I got the sense that this map store, whatever its size, was a warm and friendly operation. I took the opportunity to explain why I was buying these maps, and that I did not read Russian or Belarusian, so I didn’t know how well I would be able to understand this Grodno area map when it arrived. “Do you know what villages you are looking for?” she asked. Stunned, I named a couple others, then asked, “But how do you know the village I’m looking for is called Staro Gierniki?” To distinguish when two neighboring and similarly named settlements were founded, Polish village names may be modified by staro (old) or nowo (new). “That is where I am from, that area. I know the village,” she said simply, as if it were an everyday occurrence for a young Belarusian expatriate in Canada to be handling a credit card transaction on the phone with a Polish American trying to locate a one-street village of 15 houses where her grandmother had been born in 1882. Really, what are the odds of this happening? I never learned that young woman’s name, but I think of her every time I see her carefully printed pink Post-its on my map. Over the years, I have become familiar enough with the Cyrillic alphabet not to need these notes anymore, but I keep and treasure them as a testament to serendipity. Amazing, Basia. All of it. I want to read more. Dziekuje! Janina, the Szczuczyn area is where your paternal family is from. I'll be posting more about Szczuczyn, for sure.